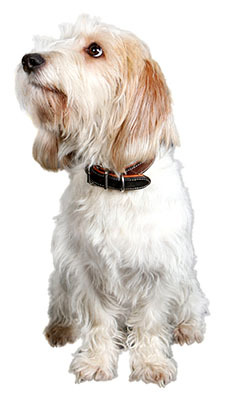 Small and scruffy, the Petit Basset Griffon Vendeen is 50% longer than it is tall. Its ears hang by its face and it has prominent eyebrows, beard and moustache. The Petit Basset Griffon Vendéen originated in France. The Petit Basset Griffon Vendéen is 13 to 15 inches (34 to 38cm). The Petit Basset Griffon Vendéen weighs 31 to 40 pounds (14 to 18kg). The Petit Basset Griffon Vendeen may be white with a variety of colored markings including lemon, orange, tri-color or grizzle. The Petit Basset Griffon Vendeen's coat is thick and wiry and requires weekly brushing, bathing as necessary, and regular nail clippings. Exuberant and eager to please, the sparky Petit Basset Griffon Vendeen is always merry and loves to explore. The Petit Basset Griffon Vendeen craves the attention of people. Curious and confident this breed is an escape artist and has been known to try and dig or jump its way out. This dog requires constant things to occupy its quick little mind. Ensure that he has lots of chew toys. Some health problems that may affect the petit basset griffon vendeen are persistent pupillary membranes, retinal folds, glaucoma, aseptic meningitis, seizure disorders, epilepsy, hip dysplasia, patellar luxation, elbow dysplasia, hypothyroidism, food allergies and skin allergies. The Petit Basset Griffon Vendéen can be expected to live 14 or more years. This breed requires moderate exercise but should never be let off a lead. Also, the Petit Basset Griffon Vendéen will try to dig its way out, so fenced yards should be regularly checked for holes. Find Petit Basset Griffon Vendéen Puppies with our Free Breeder search!